Our pick for the best lift chair currently available is the Merax Power Recliner and Lift Chair. With a clean, classic design and a gorgeous, elegant black leather exterior, this chair will look absolutely stunning with any home decor style. The patented Infinite Position Lift feature prevents the chair from locking into any position, giving the user an entirely smooth transition while using the lift function. With thick, comfortable foam padding and extending footrest paired with the ability to recline, this chair is not only functional but also incredibly comfortable. For the step up pick, we went with the Ashley Furniture Signature Design Yandel Power Lift Recliner. Available in two colors, saddle brown and black, this chair is made of super soft, comfortable faux leather. With a high back and thick cushions, this recliner is comfortable and inviting. Push button controls lift the chair fully, allowing easy entrance and exit. The chair is also protected by an incredible five year warranty, making it a great choice for those who want some extra security with their purchase. The budget pick in our search for the best lift chair on the market is the Gigantex Recliner Power Lift Chair. Ergonomically designed, this chair is soft and sturdy. The lift function is powered by a remote that is attached to the chair by a cord to allow for easy access at any moment and prevent the control panel being misplaced. Easy to use, this powerful lift chair functions with only two buttons, making it simple to learn to control. The chair appears to be a typical recliner, though it actually is an incredibly smooth and functional piece of equipment. When someone is disabled, be it temporarily through an injury or medical procedure or permanently through birth or circumstance, everyday life actions can become challenging and perhaps even daunting. Simple things like cooking or getting out of bed can become quite the task. Products to help ease the everyday hurdles are often welcome additions into a person’s routine. Lift chairs are recliners or other types of chairs that feature a lifting mechanism to help assist the user in standing from the chair’s seat. Created in the 1980s by La-Z-Boy, lift chairs have been invaluable pieces of medical equipment, with even Medicare in the United States recognizing them as necessities for people with specific medical disorders. The first lift chairs featured single buttons which, when pressed, lifted the user straight from the chair. This design was improved upon during the 1990s when the prices for microchips and similar engineering pieces fell drastically, making it much more feasible for companies to create chairs with customizable settings to suit any user under any circumstance. Many of these chairs have since been fully automated, moving from the user having to pull a lever to recline to simply pushing a button. Lift chairs have grown in popularity in recent years and are definitely expected to do so as the market space grows exponentially as well. Style: Consider the style of your chair. Typically, there are four varieties for you to consider. First, there are the two position chairs. Usually the most affordable, these chairs have a single motor which controls the back of the chair and leg rest in tandem. The second option, a three position chair, will recline further despite also working only on one motor. These are excellent for napping, compared to the two position chair that would be better suited for television watching or reading. An infinite position chair has two motors which allows the back and footrest to move independently of each other. This allows the user to recline almost entirely back to a sleeping position, similar to a bed, and gives them freedom of choice. Finally, there are zero gravity chairs. These chairs feature a box-like seat that can raise and tilt, much like a car seat. This type works wonderfully for those who wish to alleviate pressure from their spines and open up their lungs fully. Consult a doctor about which style will work best for your circumstances and you should be all set! Size: Most lift chairs can hold around three hundred and thirty pounds. Consider your size when ordering your chair, as heavy duty models cost more but will hold up to seven hundred pounds, making them still a viable option. If you have longer legs, consider buying a model with footrest extensions or if you are very petite, check measurements to make sure you will not feel sucked in by a too large chair. If possible, sit in any model you wish to pick up before you purchase it and always check customer reviews and product sizing information to help you make an informed choice. Decor: Make sure the chair will fit with your decor scheme to prevent buyer’s remorse! Consider fabric types for your lifestyle, will you prefer leather or microfiber? Do you want a large chair for your den or small one for the TV room? Should it be waterproof? Easy clean? Spill Proof? Make sure the chair fits your needs and your home well! You do not have to settle for a model you dislike. Ease of Use: This one is incredibly important. Can you handle a product with complicated controls or does something simple sound better? Those new features sound cool but will you actually take the time to learn how to use them? Make sure you can fully work the product and are comfortable with the interface and maintenance. This will be a huge help in your life, so do not let it become overly complicated and stress you out. 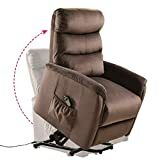 The Merax Power Recliner and Lift Chair is an absolutely incredible asset to have if you find yourself in need of such a product. The Merax chair is thick and soft. It also is appealing and the neutral color palette and classic design allows the piece to lend itself to any decor scheme with ease. It has a seamless, customizable lift and recline function, allowing you to choose any specific angle to relax at, giving the user freedom to comfortably go about their daily routine as normal. 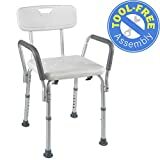 There is also a built in extending footrest to suit many heights and a weight limit of three hundred and thirty pounds. You can purchase an extended warranty for up to ten years to ensure your chair is protected, though many have stated that it is incredibly durable. The Merax Power Recliner does have a weight limit on the lower end of the average, at three hundred and thirty pounds. This can be a bit exclusive for anyone who weighs more but many will still fall within the weight limit; the reason for this limit is to ensure no undue stress is placed on the motor mechanisms which could cause a malfunction. Individuals with pacemakers are also warned against using this product for a prolonged period of time due to potential interference. For a mid-range option, we went with the Ashley Furniture Signature Design Yandel Power Lift Recliner. This chair brings all of the power of higher end models with a price closer to many budget friendly options. The Ashley branded contender does not skimp on quality, with the chair being made of luxurious faux leather and plush padding. In two colors, the classical appearance of the recliner will fit any room or home style, making it a perfect gift. 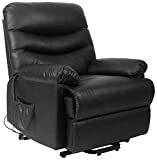 You truly cannot go wrong with the Ashley Furniture Design Yandel Power Life Recliner. This chair functions on a two button control panel: one to recline and one to lift. The remote is connected to the chair via a cord to prevent the panel getting lost, allowing for ease of use. The manufacturer claims the product is easy to assemble and durable, but also incredibly comfortable due to thick padding and plush outer fabric. This chair is amazing for taller individuals due to its oversized nature, especially those who fall into the gap between “too tall” for a regular sized chair and “too short” for the extended sizing options. If you do not have room in your home for another full piece of furniture, you can still find a means of assistance. The Stander CouchCane is a discrete, easily moved cane that will help you to lift yourself from a sitting position. Sturdy and durable, this is an excellent option for those on a tight budget or with little room. The CouchCane also includes a handy organizational pouch to keep all of your remotes and gadgets at arm’s reach at all times. If you are also in the market for a bath seat/shower assistance item, consider the Medical Tool-Free Assembly Spa Bathtub Shower Lift Chair. This chair allows you to comfortably sit in the shower, allowing you the freedom to bathe yourself comfortably and risk free. This chair features a comfortable seat and adjustable height, making it perfect for almost anyone! The AmeriGlide Horizon Standard Stair Lift is perfect for those who find themselves in need of a bit of help getting up their stairs. Do not sacrifice your mobility and home, just simply install a stair lift to help move you across floors. You can comfortably and safely maintain your autonomy and lifestyle with the AmeriFlide Horizon Standard Stair Lift, as its powerful motor and incredibly soft seat will help assist you day to day. Who is a lift recliner good for? Anyone! These devices can work in any setting, for any person, though they are intended for people who are aging, disabled, or otherwise have difficulty getting around. What should I look for in a lift chair? When purchasing a lift chair it is important to consider the user’s needs. If they plan to only use the chair for watching television, a simple two-position one will likely do the trick. A three position or infinite position one may be necessary if they wish to nap or sleep in the chair, especially if the person to use the product has back issues or respiratory trouble. It is always a good idea to check with a doctor or other medical professional before deciding on a chair to help make sure all of the user’s needs are being met to the fullest capacity! How important is your fabric selection? When choosing a chair, you should always consider what types of fabrics would best suit the user’s lifestyle. Are they going to be eating and drinking in the chair? Consider leather or a stain resistant material to help offset spills. Will they be sleeping often? Maybe a microfiber or other very soft, comfortable material will be the best fit. Review all of your options before making a purchase to ensure the best usage outcome! Are there any extra features on the market to make the chairs even better? Yes, there are! Some higher end chairs include features such as heated seats and massage functions. These do add more controls to learn but will definitely be a welcome addition if the user will partake in such functions.